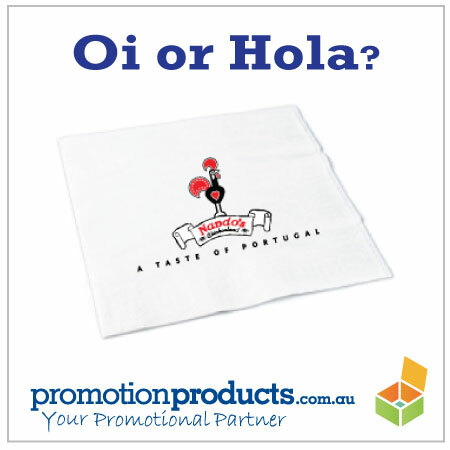 Choosing a branded napkin for an event or commercial catering application shouldn’t be difficult, but more than often, it becomes the subject of division between bean counters, bean servers – whether a more expensive cloth napkin or a branded paper napkin. I’ve worked in restaurants where cloth napkins were laboriously laundered, ironed, folded and laid out for diners, only to be soiled and spat in, basically. As “charming” as that practise is, it is repeated daily on an alarming scale throughout the developed world. Thing is, staff hate it. Paper napkins however are a delight to work with! They come ready folded (and clean! ), and are easy to dispose of, negating the need to pour fresh phosphates into our rivers and streams. Ruling out washing is an environmental benefit of the highest order. Promotional paper napkins are one of the most used hospitality supplies on the market. Couple that with their printability, and you have a winning promotional product that sells as it cleans. This entry was posted in Giveaways and tagged catering, restaurant by admin. Bookmark the permalink.